Clark’s varsity basketball team took a tough loss to their longtime rivals the Gorman Gaels Tuesday at home with a score of 61-55. The game brings Clark to second in the division and third in the state, with an overall record of 18-5 to Gorman’s 19-4. The game started out slow for the Chargers, with Gorman going on a strong 17-0 run before Clark’s first score. By the end of the first half, Clark rallied to bring the score to 36-28, a manageable differential going into the third period. Clark cut the lead to three points, led by key threes by three-star prospect and Gonzaga commit Greg Foster Jr. Ultimately, the game was a series of Clark and Gorman scoring runs, but it was capped off by half a dozen Gorman free throws. Clark was called for fifteen fouls by the end of the game to Gorman’s seven, allowing the Gaels twenty-three points off of free throws to Clark’s eight. Clark was called for three fouls in one Gorman offensive possession alone. Despite hitting more threes, passing for more assists, and out-rebounding the Gaels, Clark fell to a tightly-officiated game supplemented by Gorman’s impressive 82.14% free throw percentage. The Gorman effort was led by player of the game, 6-8 sophomore power forward Isaiah Cotrell, who led the game with 17 points, 12 rebounds, and a whopping 5 blocks. For the Chargers, strong performances from Greg Foster Jr. and Jalen Hill kept Clark in the game. Foster Jr. had 11 points, 5 rebounds, and 2 assists with two key threes late in the game, and Hill had 13 points, 8 rebounds, and 2 assists. At the end of the day, Clark stuck to its guns on in a nationally ranked matchup, getting the ball to top scorers in Foster Jr. and Hill. 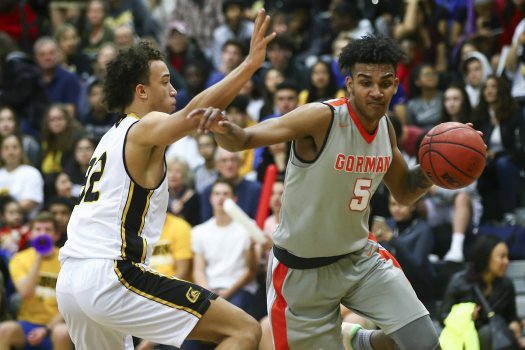 Gorman moved up to 38 in the national rankings, and Clark fell to 67.